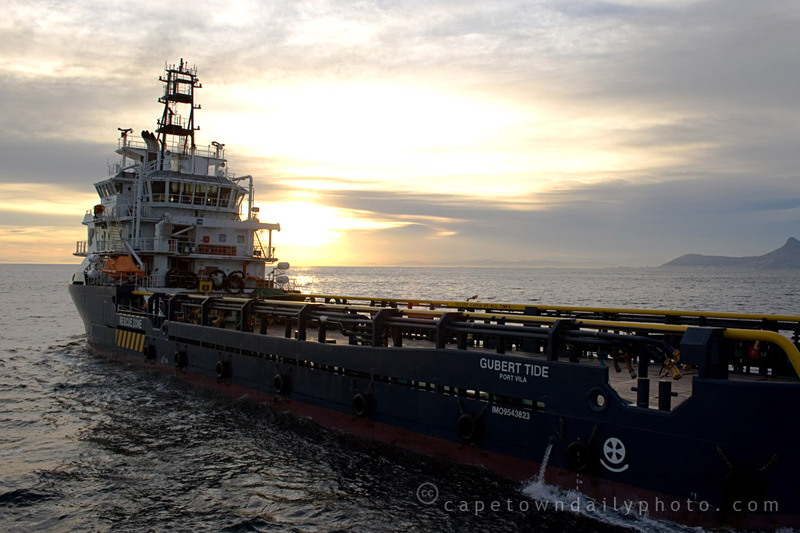 A week or more ago (while we were away in Bloemfontein watching the soccer) one of the Tidewater Marine guys emailed me about chartering a helicopter and taking photos of two boats due to pass by Cape Town's Table Bay. The two boats were the Gubert Tide and Desoto Tide, en route from Singapore to the West Coast of Africa (somewhere near Côte d'Ivoire). I read a little about the boats and found that they're reasonably new vessels, launched only this year and now being deployed to their new home near Côte d'Ivoire. Apparently, these two are Diesel-Electric-powered boats, which I understand makes them a little special in that they're not quite as bad for the environment as many other ships - they reduce CO2 emission by 30% and are lighter on diesel than traditional diesel-powered vessels. Enough about Tidewater and the boats for now, and back to the helicopter trip. If you have the opportunity you absolutely HAVE TO take an early-morning flip in a chopper around Cape Town. I now understand why this city is often considered the most beautiful in the world. But, don't take my word for it - visit again tomorrow, because I'll be posting a few more early-morning aerial photos of Cape Town. Early morning is a beautiful time to see the city and its mountains. Take a look at this article to read more about the two vessels. Posted in Activities and tagged aerial, boat, sea on Thursday, 9 July, 2009 by Paul. Beautiful photograph Paul, I can’t wait to see the others!!! Well we have been up twice now, midday and sunset – so I guess we have to do it in the early morning for the hat trick – looks wonderful. Just realised that makes us sound overly wealthy – not true, its just the ZAR/GBP exchange rate! How did you get the clarity of this shot? With the speed of the chopper and the vibration? To answer your question, we left the door of the helicopter behind which meant that I could hang out of the heli without any obstruction. Also, I shoot in RAW mode which means I had a little more control over the exposure and contrast range. If I recall, I think the only think I did during post-processing on this photo was to decrease the exposure of the sky. The vibration wasn’t too much of an issue – I just avoided leaning against any part of the heli that may transfer vibration into my arms. That is an exquisite photograph. Really beautiful. This is a lovely photograph!